Boise State's Ja'lara Walker beat Hawaii's Iwona Zagrobelna, Tanya Smith and Megan Tinnin and teammate Jenna Galassi to a rebound in last night's game. Tasha Harris scored 24 points and Jenna Galassi added 21 and Boise State outlasted Hawaii, 77-73 last night to spoil the Rainbow Wahine's Western Athletic Conference home opener. Hawaii rallied within two points with 7 minutes, 35 seconds left on a layup by Iwona Zagrobelna, but the Broncos responded with a 9-4 run and held on to improve to 4-2 in the Western Athletic Conference. The Rainbows fell to 1-4 (7-11 overall). A half of solid play against the defending Western Athletic Conference champions wasn't concrete enough. Boise State outlasted a determined Hawaii team, and point guard Tasha Harris hit three of four free throws in the final 30 seconds to secure the Broncos' fourth straight win, 77-73 over the Rainbow Wahine last night before a gathering of 296 at the Stan Sheriff Center. Tanya Smith, Hawaii's inside presence, scored 25 points and tied a season high with 17 rebounds, but a resurgent effort in the second half wasn't enough to climb out of a 16-point halftime deficit. Smith, who leads the conference in rebounds and blocks, notched her eighth double-double in nine games and rejected three shots, but missed three of four foul shots -- including the front end of a 1-and-1 -- in the final moments, while Harris converted for the Broncos. Iwona Zagrobelna scored 13 points and grabbed seven rebounds despite not checking in until the second half, and Megan Tinnin and Saundra Cariaga added 12 apiece. Coach Jim Bolla said the team won't take heart in the fact that the narrow loss came against the team picked to win the WAC again. "At halftime we went in, and said we were just getting outplayed," said Bolla, referring to the 43-27 deficit. "We were letting them shoot the ball, weren't challenging the shots. They're really confident, and they're a championship team. Even in the second half when we were bothering them, they weren't rattled. I'm proud that we battled back, and our goal right now is just play this way against Idaho (tomorrow)." Turnovers (23) continued to plague the Rainbow Wahine (7-11, 1-4 WAC), who are last in the conference in keeping a handle on the ball and have committed more than 20 turnovers in each of their WAC games. Free throws also came back to haunt Hawaii, as it converted only 11 of 21 (52.4 percent) for the game. 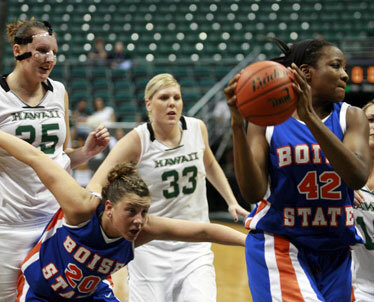 Hawaii's Tanya Smith went to the hoop against Boise State's Sierra Moeller last night at the Stan Sheriff Center. On the bright side, the team finally found an effective lineup combination after searching over the last three games. Keisha Kanekoa came off the bench for a shaky start but played well in the second half, with eight points and six assists. Smith and Zagrobelna played off each other smoothly in the post, and Cariaga capitalized with some free looks. An effective move defensively from the amoeba system to a 2-3 zone helped create some turnovers. "I think that we just were a lot more confident in the second half," Smith said. "I don't know what happened in the first half. We were a little bit timid. Iwona went out there really tough and we used the post effectively." Tinnin, who made her second straight start, got all of her points from beyond the arc in shouldering the scoring load early -- starting guard Amy Kotani was out with an injured ankle. Kotani is likely not available tomorrow against Idaho, Bolla said. Hawaii shot a vastly improved 47.2 percent in the second half after a dismal 33.3 mark in the first, but found itself in a deep hole when the Broncos got efficient scoring from an unexpected source. Forward Jenna Galassi, who averages just over five points per game, couldn't miss. She sparked the Broncos with 19 first-half points on 9-for-9 shooting by halftime, which surpassed the junior's previous career high of 15 as the Broncos shot 52.9 percent before halftime. Harris posted a team-high 24 and Galassi final mark of 21 points helped make up for an off night from the WAC Preseason Player of the Year, Jessica Thompson, who had eight. "My teammates just saw me, kept giving me the ball, and had confidence in me," Galassi said. "I tried to step up to the role. If something's working for me I have to keep going at it, keep shooting." The Rainbows hustled coming out of halftime, going on a 12-6 run. They cut the deficit to seven on Cariaga's offensive rebound and fadeaway with 13 minutes left, and to six on her free throw at 10:15. Zagrobelna hit one of two technical free throws to cut it to 56-51 and she converted another on the ensuing possession to make it a four-point game. Boise countered with a 9-4 run and Hawaii would do no better than being tantalizingly close. 3-point goals -- BSU 9-27 (Lee 3-8, Thompson 2-4, Harris 2-7, Galassi 1-1, Moore 1-4, Moeller 0-1, Malone 0-2), Hawaii 6-21 (Tinnin 4-12, Galdones 1-1, Cariaga 1-2, Kanekoa 0-3, Liepkalne 0-2, Zagrobelna 0-1). Personal fouls -- BSU 15, Hawaii 17. Fouled out -- Kanekoa. Steals -- BSU 13 (Harris 5, Galassi 3, Lee 2, Moeller 2, Thompson), Hawaii 7 (Tinnin 2, Cariaga 2, Kanekoa 2, Smith). Blocked shots -- BSU 3 (Lee, Rima, Moore), Hawaii 5 (Smith 4, Zagrobelna). Turnovers -- BSU 19 (Harris 4, Moeller 4, Lee 3, Stewart 2, Moore 2, Galassi, Malone, Rima, Walker), Hawaii 23 (Smith 5, Kanekoa 5, Cariaga 4, Zagrobelna 3, Jones 2, TEAM 2, Tinnin, Galdones). Officials -- Shelley Nakasone, Jim Morrell, Bryan Barr. A -- 1,492.